Cold weather has finally started to move in around here and for me that usually means mountain stream fishing is for the most part done until spring. Time to move to the tailwaters and large rivers for a few months. I get a little bummed about that every year. I mean, the big waters are ok, but those mountain streams - well, they're special. And I miss them every winter. With that in mind, I wanted to get one more trip into the mountains before I called it a season. 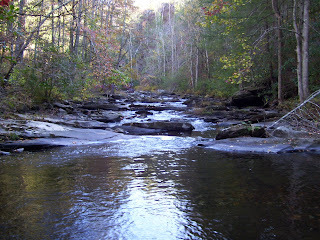 The North River in the Tellico Basin was the obvious choice. I love that river and she has been very good to me in '07. I often take clients to the North when I'm guiding, and we had some especially good trips this year. I saw many people catch their first trout with a fly rod on this river. Using dry flies more often than not. Many of these folks had never cast a fly rod in their lives and it was a big thrill for them to see those aggressive wild rainbows come up and smash a stimulator or humpy. It has been a few weeks since I've done a trip or even fished up there, so I needed one final North River fix before the cold air settles in for the winter. I rolled into Tellico Plains around 7:30am and made the obligatory stop at the Cherohala Market for a couple of tenderloin biscuits. Actually, they didn't have the tenderloin (damn!) and I had to get by with a couple of sausage biscuits. Anyway, belly now full, I finally made it to the river at 8:30. That's the Tellico River. I decided to see how the DH was fishing there before I went on up to the North. 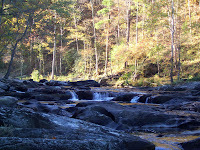 I hit the usual runs above and below the bridge just downstream of Bald River falls. Picked up a few stocker rainbows in the 12-14 inch range on an olive woolly bugger. Missed a few strikes as well, but overall the DH action wasn't exactly fast and furious. Still, enjoyed the morning down there with the morning sun and the fall colors igniting the gorge. It was spectacular. 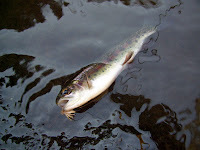 Around noon though, I started thinking about those wild trout in the North River. I reeled in and headed upstream. I never get tired of the North. I fish it. I guide on it. I walk its banks dozens of times every year. And I still can't get enough. Heck, I rarely make it past the first pull-off above the river's mouth before I stop and start fishing. Today was no exception. I pulled the Jeep into the second pull-off, tied on a #16 parachute Adams and began working my way upstream. About 5 casts into it - bang - a nice rainbow hammered the fly. He had bright slashes of pink running the length of his flanks and sported prominent parr marks from stem to stern. Incredible fish. And so it went. Dry flies and wild rainbows for the rest of the day. Lost a good many as per usual, but also brought some real beauties to hand. The fish seemed to be in pretty good shape, which was nice. The dro ught has water levels at all time lows and the water temps have been creeping up to dangerous levels by late summer. The fish seem to be handling it though. A couple of the larger fish seemed just a bit on the thin side, but most seemed in peak condition. Although the water is low, the temps on both the North and the Tellico have dropped to around 48 degrees. This is good news. Hopefully, we'll get some rain in the coming months to put some water back into the basin. Still, the fish seem to be doing well despite this miserable drought. It was a nice farewell until spring. The North was kind enough to give me one more great day for the year. I'm thankful for that.